We love this amazing Summer Infant Pop N Sit Folding Booster, and today it's on offer at Amazon for just £20.99, meaning that you can get free delivery too! 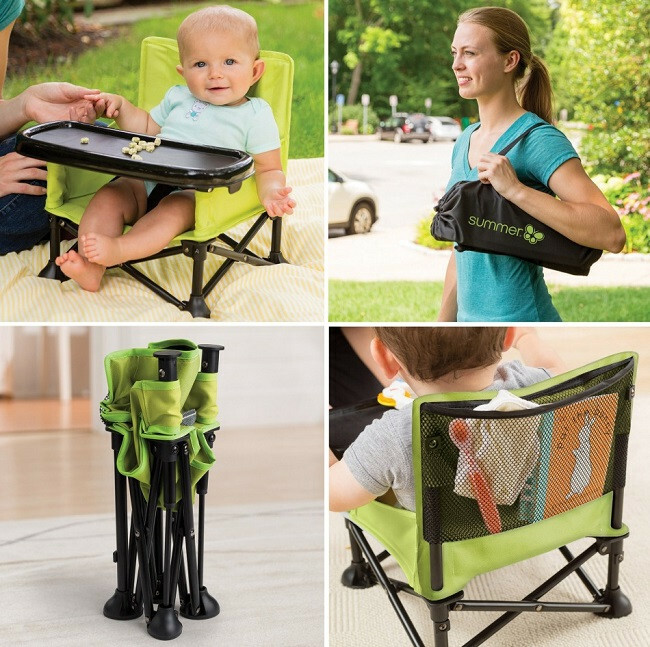 This is a unique portable booster seat for babies that can fold up and open in seconds making it really easy to take out and about with you. It's lightweight and comes with it's own carry bag, has a removable BPA-free tray, uses straps to secure your little one in place, and extra straps to secure it to an adult chair if you want to use it as a booster rather than on the ground. There's also a pocket on the back of the chair so you can keep essentials like wipes on hand. This looks really compact and portable, and it is small enough that you could pop it under your pushchair or in the car boot as it takes up so little room. We think this would be perfect for camping, picnics, visiting family, holidays and day trips. It would also solve the problem of restaurants and cafes running out of highchairs on busy days - it's no issue if you have your own with you! Super Saver Delivery is free of charge for all customers, with Prime customers benefiting from free One Day Delivery. I actually bought this last night! Was just looking at this! we need these for the boys ! You know I love mine!! One of the best things we ever bought- couldn't recommend highly enough.